Low fat and ready in under 30 minutes, this winning combination of chicken and lemon potatoes is sure to become a favourite recipe. Cook the potatoes in a large pan of boiling water for 10-15 minutes, until tender. Meanwhile, place each chicken breast between 2 sheets of greaseproof paper and bash with a rolling pin until they are about 5mm thick. Season. 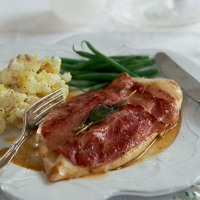 Lay a piece of ham on top of each chicken breast and top with a sage leaf. Secure with a cocktail stick. Heat the oil in a large, non-stick frying pan and add the chicken, ham-side down. Fry for 2-3 minutes, until starting to turn golden. Turn the chicken over and cook for a further 3 minutes. Reduce the heat slightly and pour in the chicken stock. Bring to a gentle simmer, then cover the pan with a lid or foil and simmer for 3-4 minutes, until the chicken is cooked through and the juices run clear when pierced with the tip of a knife. Drain the potatoes well and crush with a fork. Stir in the crème fraîche, lemon zest and seasoning. Serve with the chicken and steamed green beans. Turkey breast steaks make a great alternative to chicken in this recipe. Prepare and cook in exactly the same way. For traditional flavour, substitute the stock for 2 tbps of Masala wine.